The might of Callaway Golf has teamed up with the might of Nikon to produce the Callaway LR550 Rangefinder. With these two powerhouses working together, you can expect very good quality results, and the LR550 certainly does not disappoint. 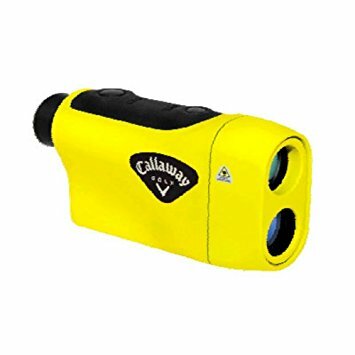 In this article we are going to take a closer look at the Callaway LR550 Rangefinder to provide you with as much information about this model so that you can make an informed purchase decision. With so many rangefinders to choose from, it is important you get one that matches your requirements perfectly. Two of the most important factors of any rangefinder are accuracy and ease of use. With golf, every yard counts, so having a range finder that is 1 or 2 yards off can cause you to make the wrong decisions with your club selection. You also do not want to be fiddling around with it forever trying to get the thing to give you the range. Fortunately the Callaway LR550 is extremely accurate, and easy to use too. The Callaway LR550 has a range of up to 550 yards, which is more than enough distance to work with. With the Nikon components used to make the LR550, you get extremely accurate results, and they are delivered very quickly too. You do need to have a steady hand so that it can zoom into the right point and give you the right distance, but you can expect accurate and fast results each time. It uses 6x optics, made by Nikon of course. Their anti-reflective coating used on the lenses eliminates any glare and also provides ultra-high resolution images, so you are able to zoom in to the point of focus quickly and easily. There are different modes used on the Callaway LR550 to allow you to get the measurements for either the flag, or different objects such as bunkers and trees. The first target mode will enable you to get an accurate reading to the pin, even when there are trees and other objects in the background. There is also a continuous mode, which can run for up to 8 seconds. This will enable you to get the right distances for multiple objects such as bunkers, water hazards and trees at the same time. Being able to have an accurate picture of the things ahead of you like this will really help you to get the ideal club for the next shot. The Callaway LR550 is extremely easy to use. There is just one button to operate and another to change the modes when required. There is also an LCD display that shows you all of your distances. This display is very clear, and you can read it even when it is really bright and sunny. The compact size of the Callaway LR550 makes it very easy to carry around with you. It will fit nicely into any of the smaller pockets on your golf bag, or you can even carry it on your person and it will not present any hindrance to your swing at all. With its ease of use, accuracy and compact size there is really no negative areas to this rangefinder. The Nikon components used inside ensure that the results you get back are right on the money each time. The case is also waterproof, so you do not have to worry about it if (and when) the weather takes a turn for the worse. Overall the Callaway LR550 is a really good quality rangefinder that does everything it is supposed to do extremely well.